CLICK HERE to get your tickets now! Taste the area’s premier wineries, breweries, & distilleries while shopping Bothell’s historic Main Street retailers. 10+ retailers are hosting your favorite local wineries, breweries, and distilleries! 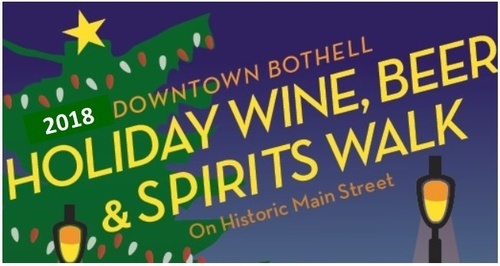 Grab your friends, bring your favorite drinking glass and head to the new downtown Bothell for the Holiday Bothell Wine, Beer & Spirits Walk! Check in / Bottle Sales at Evergreen Karate! Go there to get your event wristband, 10 tasting tickets, and your map to find out which shop is hosting which winery/distillery/brewery. Most shops will also have delicious snacks to enjoy. Don’t forget to keep track of your favorites and head back to Evergreen Karate when you are done tasting to purchase bottles to take home (at discounted prices!). Must be 21 years of age or older to participate. Additional tastes available for $1 each. Event is a collaboration between The Bothell Kenmore Chamber of Commerce and Seattle Uncorked.